March 7, 2019: 10:00am. Gail Borden Library, Elgin and Grove Room 2nd Floor. Are you interested in entering your student into the 2019/2020 lottery? 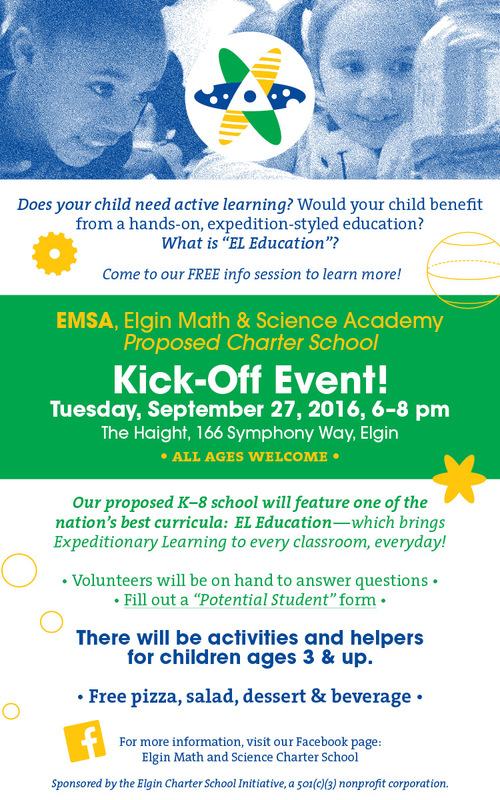 Would you like to learn more about the Elgin Math and Science Academy Charter School as an option for your child? Come and meet our staff, tour our school building, and find out how EMSA brings the Wow and Wonder to students in the Elgin area and surrounding communities. EMSA is now accepting applications for new students entering Kindergarten – 4th Grade in 2019/2020. November 27: Giving Tuesday, A day of online giving local non-profit organizations. This year, EMSA will be participating in Giving Tuesday to raise funds to expand our outdoor play and learning spaces! Check us out on #ILgive! Thursday, October 25: Nature Night for EMSA students and parents. 5:30 to 6:30pm. EMSA’s Back-to-School Night will be on Tuesday, August 14th from 4:30pm – 6:30pm! Families are welcome to drop in at their convenience during our Back-to-School hours. We will do our best to accommodate all parking needs. Your visit should only take about 15 minutes. During the Back-to-School Night, you will have the opportunity to check out your student’s classroom, meet your student’s teacher and drop off your student’s supplies. Stop by EMSA any time during these designated registration days! Walk with the EMSA Crew! If you would like to join us, please contact: info@emsacharter.org! Parade participation and staging map. Location: Imago Studios in downtown Elgin, 216 Prairie Street. $5 suggested donation, at the door. EMSA is partnering with Side Street Studio Arts and their Going Dutch Festival – a celebration of the female voice in dance, music, theater, and the visual arts – to offer a fun evening of art, dance, and new friends. Each group will work with three visiting professional dance artists to get their creative juices and bodies moving! A fun night out for EMSA students and their siblings – ages 4-9. Young artists must be signed in at the beginning and out at the end of the event. There is limited space available. First come, first served. Pack a picnic lunch and join your EMSA Crewmates and Friends of the Fox for this hands-on educational event focused on our very own Fox River! > Get your hands wet with water explorations! > Listen to river stories! > Mingle with experts on river ecology. > Visit green business vendors. We are thrilled to announce that we have our 2018/2019 students registered and ready to embark on their EMSA journey! We are celebrating this milestone with our EMSA families on Thursday, May 17, from 6:00pm to 7:30pm. Meet teachers and staff, mingle with other EMSA families, pick up your student’s t-shirt, and get to know EMSA’s partners! We will also be “launching” our new logo at the celebration as a way to welcome our inaugural class! EMSA’s lottery is open to the public. The lottery is designed to be an administrative event (versus a public celebration event). Parents and guardians will be notified of results via text, email and U.S. mail following the lottery. EMSA will be utilizing SchoolMint, an online enrollment system, to run its lottery. EMSA is hosting an Open House for interested families on Tuesday, March 20. Stop by to learn more about our school, meet our principal Ms. Lezlie Fuhr, and register your child for Fall 2018! EMSA is hosting an Open House for interested families on Saturday, February 10. Stop by to learn more about our school, meet our principal Ms. Lezlie Fuhr, and register your child for Fall 2018! JOIN US at our Mardi Gras fundraising event – you’ll enjoy delicious creole food, live music, fun costumes and a silent auction. Laissez les bon temps rouler! . Visit EMSA at the Preschool Information Fair. Our team will be answering questions and accepting student applications for 2018/2019. Join EMSA in dining at Panda Express. 20% of all proceeds will be donated to support EMSA family outreach, student recruitment and staff training. Stop by the Winter Wonderland Market and visit our Wow & Wonder-filled table! There will be a drawing for a bundle of STEM gifts, holiday slime fun, and representatives from EMSA to answer any questions about the school you may have. Tuesday, November 28, 2017, 12:00am – 11:59pm: GIVING TUESDAY! On the Agenda: Approve Staff Recommendation to Grant the Appeal SCSC 18-001, by the Elgin Charter School Initiative, of the Elgin Area School District U-46’s Denial of the Elgin Math and Science Academy Charter School. Stand with us as the Commission makes their final decision! EMSA Family Fun Night! Join us for popcorn, ice cream & games. Children are welcome at the pizza party & the hearing! We will have volunteers on hand to help. Board of Education Candidate Forum hosted by the U-46 Citizens’ Advisory Council. Considering speaking at the public hearing? EMSA team members will help you prepare and practice. EMSA Charter School Proposal application submitted to U-46. We will submit our charter application in January 2017 and need evidence of community support. Please add your name to our Statement of Support now! Friday, October 14, 2016. 7:30 a.m.-12:30 p.m.: Join us for a charter school visit! Elgin Math & Science Academy Kick-Off Event!